The Italian affiliate of l’Incanto, l’Incanto Italia, participates in a research project financed by the European Community for the identification of active ingredients extracted from the plants which develop in the South of Italy. The research began its works on numerous present plant extracts in Calabria, very interesting bioactive components from the cosmetic, nutritional but also environmental point of view. Our researcher as well as the researchers of the Universities of Salerno and Reggio Calabria highlighted the high antioxidizing activity of the skin of the red onion of Tropea, usually considered as a waste, by determining exactly its chemical composition constituted mainly by flavonoids which is a fundamental prerequisite for a more sustainable and productive use in cosmetic, pharmaceutical and nutraceutical formulations. Also, if the quality, the aroma and the taste of the roots of Calabrian licorice are world-famous, the air parts of the licorice usually considered as wastes were analyzed and turn out to be surprisingly a source of bioactive ingredients for the plant itself and for us because of the presence of numerous components belonging to 2 major classes of polyphenols. From an ecological perspective, the flavonoids in the outer leaves part represent a more efficient plant protection against insects. Given the antimicrobial and antiinflammatory properties of the main components of the air parts of the licorice, it is obvious that these "wastes" represent a source of potential raw material to recover health-promoting ingredients for cosmetic, nutraceutical and food sectors. Further studies are underway to assess their applications. Look for ingredients in Nature to preserve naturally the beauty enchantment. 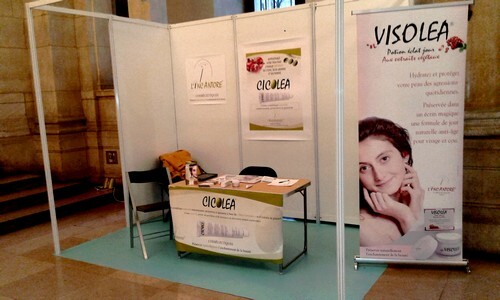 L’ ÏNCANTORE participated in the 12th Congress of Morphological Medicine and Anti - Age on January 26th, 2018 at the University Descartes Paris V, the opportunity for him to present Visolea Radiance day Potion to the numerous present practitioners. 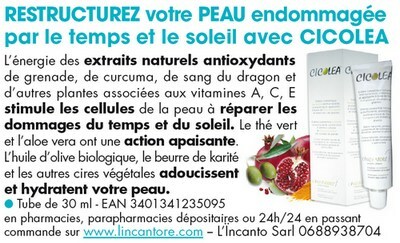 CICOLEA in the magazine "ANFORM Santé et bien être"
CICOLEA is present in the magazine "ANFORM Health and Wellness in the West Indies-Guyana" of May June 2017 distributed in Guadeloupe..
Cicolea will be present on "Santé Magazine" published on 30/04/2015 and on "Top Santé" published on 31/05/2015 . 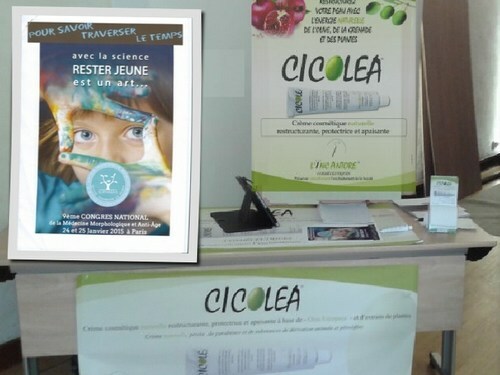 L’ÏNCANTORE was present at the 9th Congress of Morphological and Anti-Aging Medicine on 2015 January 24-25 in Paris with the presentation of preliminary results of a study including the use of CICOLEA cream on skin.